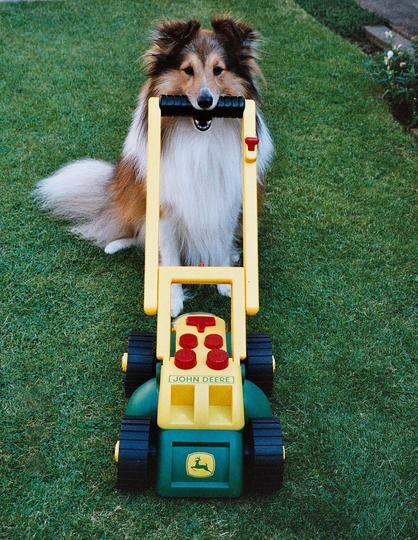 Conker the Shetland Sheepdog with his new gardening equipment. This mower makes 'real sounds'. You want to buy a Staffie? You want a Staffie GIVING? Ed simply knocks down plants. His latest was a new Yellow River magnolia snapped. I didn't mind the £30 but he didn't even offer to pay me. Did Ed offer to water the magnolia ? Isn't he clever AND gorgeous! I take it you are talking about Conker Arlene and not my idiot magnolia killing (he also chews up quinces) mutt. Maybe some time you can upload a photo of your Dad's antique tractor collection? I would be very interested to see that. Your Jack Russell Terrier, Cole looks bright and intelligent. Will be away for a week from today visiting sister in Newcastle-have a good week! This dog is such a sweet thing! How much does he weigh? much smaller than a Rough Collie. I guess he weighs about 16 lbs. I have a very nice Daisy Bush. Nobody is allowed to prune that right now. Lol. I bet Lassie is very clever and quick to learn. On my Wellie Olympics Blog, Captain Grenville, our Team Manager, confirmed that Conker is a canine member of our GoY Wellie Olympics Team. It's also called 'Lassie, Come Home' c. 1943. Conker was practising with this mower yesterday in my lounge. He also pushed up and down the bigger mower which belonged to Bonsai in the other photo. I have the best mown lounge carpet on GoY ! Then Conker had a go with a toy vacuum cleaner on the same carpet. Conker must be an even greater friend now. Yes I remember the story of Ed and the Yellow River Magnolia. Lol. Have we seen a recent photo of Ed. ??? Where have you planted which you consider safer ? Maybe Ed is working out a plan to reach it even now. Lol. Yes, Conker is certainly centre stage, right now, except that Crocus the budgie is also aspiring to be Alpha dog :o). Reminds me of Lassie come home. Conker also now practises with Bonsai's birthday mower from the other photo. It's no good, Sylvia wants it added to my favourites, reminds her of their lovely sheepdog when she was at home. His name was Bryn, he worked with her father who never had any sheep, but he rounded up 73 cows and a bull! for milking. LOL. The bull always followed the girls. Conker says he is pleased to be on your favourites. I bet Sylvia has good memories of Bryn. A sheepdog's instinct is to herd. They'll round up anything ~ ducks, sheep, people. But 73 cows and a bull ~ that's quite a task ! Great job. The lawn looks GREAT ! Lol. Conker the Sheltie also does a very good golfing routine. He has his own clubs and golfcart, which he tows along. He even rakes all the bunkers. Maybe he could accompany you on the golf course. But I must warn you he's a top rated player..
You are a hoot! I think where I go there is a sign no dogs allowed on course but I bet Conkers is better behaved than some golfers I seen displaying their anger and childish antics. P.S. If you have a short Video clip of the protege in your family why not down load it on youtube or something of that nature if you have not already. No video, but I do have photos of Conker at a charity dog show, doing his tricks. Bow wow, ruff ruff to you Conker and I will be looking forward to your photos. Be good and enjoy your week end my new cyber GOY friends. I dare you to do the breast stroke to here. I'll be nice how about the butterfly? ok the dead mans float! I'm really enjoying myself in here and best of all being a blue blood myself but born here in Canada it gives me a connection to my families heritage talking with you abroad. I love you GOYs. When I was quite young, I achieved my mile swimming certificate, but that was far enough. Lol. Good to be in contact via internet across the pond. Have you ever visited Britain ? Conker was mowing my lounge again today. In fact he did his complete gardening routine, with raking, collecting up the flower baskets, measuring the plot, and mowing. I must get out his piano. No the answer to visiting Britain. I could kick myself many times that my folks have visited (at least once a yr) I was asked to come along but felt I should go on my on steam not theirs as I had no money (still in school) Now that I'm sitting here with more time and enough money they have passed. I do have my moms address book one of the few things I retrieved along with her charm bracelet among other articles.